Don't miss this wonderful opportunity! This Item is a Handy Mans Special! 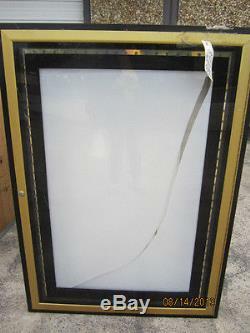 Gold & Black Back Lighted One Sheet Theater Poster Case! This item Needs a New Lock, there are no Keys. We have not opened it But it appears to have the inner glass broken as You can see in the Photos. The Dimensions are 51" tall 6 inches thick and 37 " in Diameter. The item "Gold Black Back Lighted One Sheet Theater Poster Case! Handy Man Special" is in sale since Sunday, August 18, 2013. This item is in the category "Cameras & Photo\Vintage Movie & Photography\Vintage Projectors & Screens". The seller is "kinemaman" and is located in Atlanta, Georgia. This item can be shipped to United States.